Description :- Broaching device is constructed from high quality steel which provides long life of product. 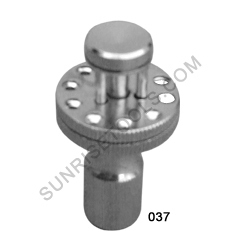 Description :- Rotating Bur and Tool Holder holds and organizes 114 burs with 3/32" shanks. Measures 7" wide with a center cup to hold pliers, screwdrivers, etc. Rotates on smooth ball bearing. 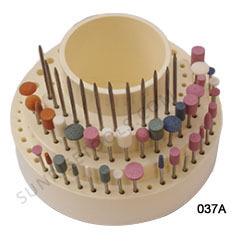 037A Revolving Bur and Tool Holder It can hold 114 Burs, 3/32" Shank Size with handy 3" x 2 3/4"
Description :- This magnetic bur holder keeps burs readily available for the busy jeweler. Made of high impact plastic, with an extra strong magnet for quick retrieval of burs, drills and other rotary instruments. 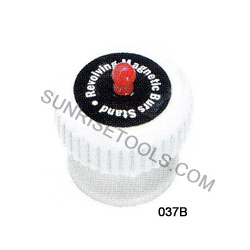 037B Plastic useful on work Bench to hold small tool/ Bur that tend to roll away and get misplaced.